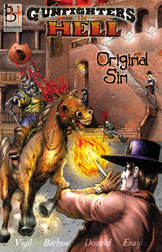 In this FULL COLOR prequel to the classic "Gunfighters in Hell" series, the blood of damnation runs deep. For the condemned, some origins are best left untold. But eternity is a very long time, and a six-shooter loaded with hellfire always finds its way through bone to the rotten marrow inside. Hell is a place where secrets die hard and no good deed goes unpunished. So saddle up, shoot from the hip, and get ready to take a ride through the baddest badlands of them all!